They gave themselves up wholly to their sorrow, seeking increase of wretchedness in every reflection that could afford it, and resolved against ever admitting consolation in future. Sense and Sensibility (1811) is a novel by Jane Austen, the first of her novels to be published, under the pseudonym "A Lady." No sooner was his father's funeral over, than Mrs John Dashwood [...] arrived with her child and their attendants. He was not an ill-disposed young man, unless to be rather cold hearted, and rather selfish, is to be ill-disposed. [...] people always live for ever when there is any annuity to be paid them. He was not handsome, and his manners required intimacy to make them pleasing. He was too diffident to do justice to himself; but when his natural shyness was overcome, his behaviour gave every indication of an open, affectionate heart. Brandon is just the kind of man [...] whom everybody speaks well of, and nobody cares about; whom all are delighted to see, and nobody remembers to talk to. Yet there is something so amiable in the prejudices of a young mind, that one is sorry to see them give way to the reception of more general opinions. [...] mindful of the feelings of others; and much was said on the subject of rain by both of them [to change topic]. To hear those beautiful lines which have frequently almost driven me wild, pronounced with such impenetrable calmness, such dreadful indifference! The pleasantness of an employment does not always evince its propriety. I never wish to offend, but I am so foolishly shy, that I often seem negligent, when I am only kept back by my natural awkwardness. Shyness is only the effect of a sense of inferiority in some way or other. If I could persuade myself that my manners were perfectly easy and graceful, I should not be shy. Know your own happiness. You want nothing but patience; or give it a more fascinating name: call it hope. As it was impossible however now to prevent their coming, Lady Middleton resigned herself to the idea of it, with all the philosophy of a well bred woman, contenting herself with merely giving her husband a gentle reprimand on the subject five or six times every day. In spite of the absolute necessity of their returning to fulfil them immediately, which was in full force at the end of every week, they were prevailed on to stay nearly two months [...]. Sir John was delighted; for to a man, whose prevailing anxiety was the dread of being alone, the acquisition of two, to the number of inhabitants in London, was something. His own enjoyment, or his own ease, was, in every particular, his ruling principle. There was a kind of cold hearted selfishness on both sides, which mutually attracted them; and they sympathised with each other in an insipid propriety of demeanour, and a general want of understanding. Nothing gave any symptom of that indigence [...] – no poverty of any kind, except of conversation, appeared – but there, the deficiency was considerable. [...] a punctuality not very agreeable to their sister-in-law, who [...] was then hoping for some delay on their part that might inconvenience either herself or her coachman. Elinor agreed with it all, for she did not think he deserved the compliment of rational opposition. 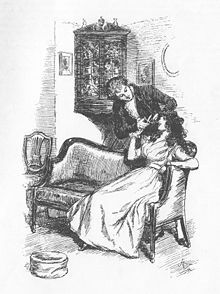 Elinor was to be the comforter of others in her own distresses, no less than in theirs; and all the comfort that could be given by assurances of her own composure of mind, and a very earnest vindication of Edward from every charge but of imprudence, was readily offered. I did not then know what it was to love [...] had I really loved, could I have sacrificed my feelings to vanity, to avarice? I suppose you know, ma'am, that Mr. Ferrars is married. [...] an earnest, an unceasing attention to self-interest, however its progress may be apparently obstructed, will do in securing every advantage of fortune, with no other sacrifice than that of time and conscience. No indeed, I am never too busy to think of S & S. I can no more forget it, than a mother can forget her sucking child. Letter 70, Jane Austen's Letters to Her Sister Cassandra and Others, ed. R. W. Chapman, 2nd edn (London: Oxford University Press, 1952; repr. 1979), p. 272. This page was last edited on 29 November 2016, at 15:29.